The idea of diasporic-Canadian literature is something of an oxymoron: diasporic literature often demonstrates the instability of national categories, and scholars who use diaspora as a critical lens are often trying to demonstrate how the nation-state is something of a self-defeating or unstable basis for collective identity. The surge of Canadian literature by racialized authors that followed these changes has been interpreted by some scholars as evidence that national boundaries and national cultures are no longer as stable, powerful, or impermeable as they once were. We can consider whether the present historical moment contradicts these critical narratives about the dissolution of national and cultural boundaries as we watch nation states such as the United States and Britain work to reestablish the idea of a firm, enduring, and often racially exclusive national culture. Are nation states and national cultures more or less powerful than they have been in the past? 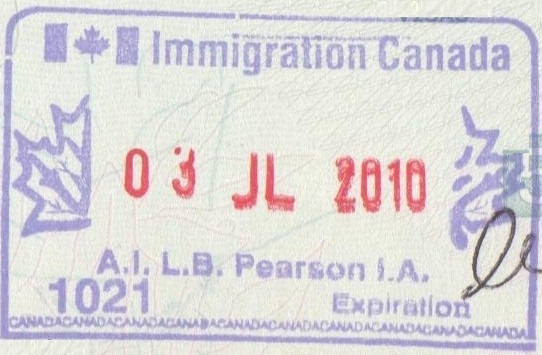 An Immigration Canada stamp from Toronto, Ontario. By Scoelho86, CC BY-SA 3.0, via Wikimedia Commons. Because it can challenge the exclusions perpetuated by nation states and the hypocrisies inherent in nationalism, the writing that emerges from diasporic communities is often celebrated in literary studies. And, indeed, we have seen in Canada the extent to which diasporic literature has been folded into multicultural discourse, included in the literary canon, and thereby legitimized by the state. In her book Scandalous Bodies: Diasporic Literature in English Canada, however, Smaro Kamboureli ask us to consider how a “celebration of diversity [by the majority culture] becomes yet another way of containing it” (163). It is important to remember that diasporic communities can be simultaneously used to affirm the nation’s narrative and rejected by the nation. Within all nations, including Canada, there is a periphery, a grey area occupied by those who are not allowed—or do not wish—to claim national identity or participate in the nation’s self-making projects. Not all Canadians are recognized equally (see “Introduction” to Poetry and Racialization), and many communities that are labeled “Canadian” do not identify as such (see “Indigenous Literary Nationalism”). Answers to the question “what is mainstream Canadian literature/culture?” have shifted over time. What geopolitical, social, or philosophical changes correlate with these shifts? Do you see any of these changes represented in bookstores, in reading series, or in literature course syllabi? At times, literary scholars might seem to use terms such as “transnational,” “diasporic,” and “global” as though they are synonymous or interchangeable. Where do these concepts start to blur together for you? 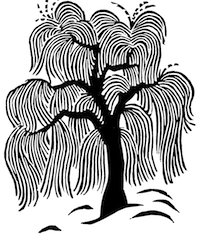 What differences—whether significant or subtle—do you see between them? Do you think national cultures are stronger, weaker, or roughly the same today as they were 50 or 100 years ago? Why? Working towards greater specificity, let’s break down this question: which groups are most comfortable claiming Canadian, American, or any national identity today? Which groups are not comfortable—or not allowed—to make these same claims? Dobson, Kit. Transnational Canadas: Anglo-Canadian Literature and Globalization.Waterloo: Wilfrid Laurier UP, 2009. Print. Kamboureli, Smaro. Scandalous Bodies: Diasporic Literature in English Canada. Waterloo: Wilfrid Laurier UP, 2009. Print. Kim, Christine, and Sophie McCall. “Introduction.” Cultural Grammars of Nation, Diaspora, and Indigeneity in Canada. Ed. Christine Kim, Sophie McCall, and Melina Baum Singer. Waterloo: Wilfrid Laurier UP, 2012: 1-18. Print.